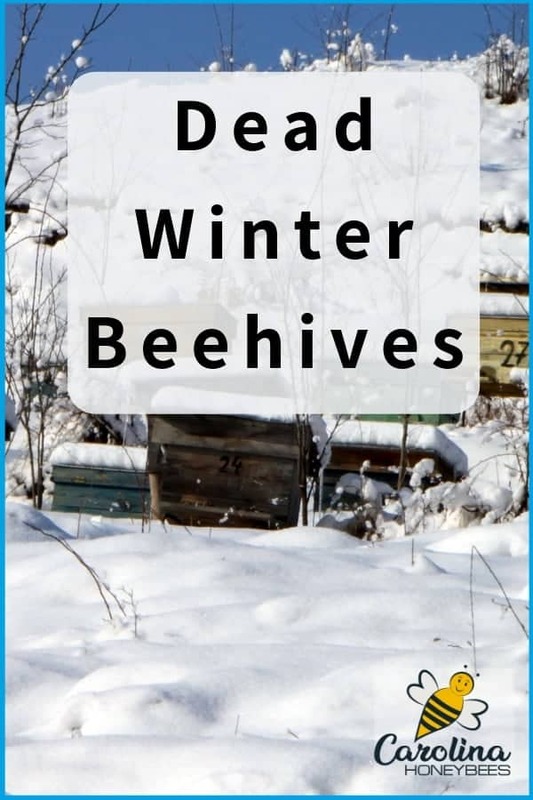 Dead Bees in Winter – Why Did My Hive Die? Beekeepers work very hard to maintain healthy honey bee colonies. We go out to check our colony on a mild winter day and find our hive dead. It is so discouraging to find dead bees in Winter. We sometimes blame ourselves but is it our fault? As we beekeepers spend winter days perusing through beekeeping books and journals. We find ourselves thinking about that dead beehive. Why did the bees die? The possibilities are many but we have a few common reasons to consider. Over-wintered colonies are valuable. Beekeepers work diligently to prepare colonies for the long, cold winter weather. A strong colony coming out of Winter has the potential to be a good honey producer the following Spring. During Winter, honey bees cluster inside the beehive and survive by consuming stored honey. You may not see much activity from the outside, but the bees in the hive are working together to survive. A colony that has made it through Winter in good condition may have good genetics. 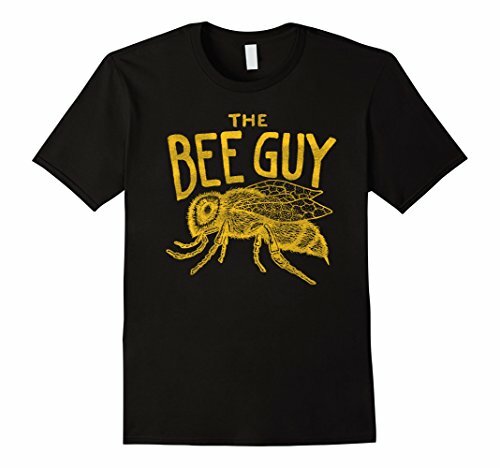 We strive for this type of bee. And the beekeeper, has invested a lot of time and working into prepping that colony for winter as well. 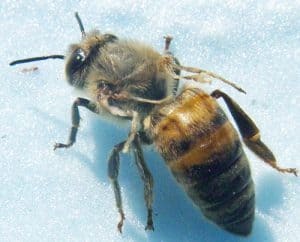 Finding dead bees in Winter (or any other time) is a frustrating experience for any beekeeper. It is especially difficult for new beekeepers who have worked to become the best beekeeper possible. They worry that they failed to do something. Is it something we did or didn’t do that caused our colony to fail? Sometimes, yes it is something we failed to do. But that is not always the case. A dead hive is a sad outcome, no one will deny that fact. However, it is also an opportunity to learn. Once you find a dead hive, it is time to do a necropsy. We piece together various bits of information to tell the story of the dead bee colony. It is very educational to attempt to understand why a colony has perished. Learning what went wrong may offer a chance of preventing the same outcome in the future. This is where I rely on my beekeeping journal and notebook. I may not remember what I did in each hive for Winter prep but my notes will remind me. Many times however, we never know for certain why the bees died. Lets examine some of the primary reasons for colony death during Winter. Cold temperatures play a role in dead bee hives. Honey bees are cold blooded insects. If their body temperature drops too low they become sluggish and unable to move. Unless the bees become warm quickly they will die. A small colony of bees is more likely to die during Winter due to cold. Bees have a ingenious system for surviving during the cold months. The honey bee cluster is nature’s way of preserving bee life during Winter. Bees cluster close together inside the hive. Honey is consumed and heat generated by vibrating their wing muscles. The system works amazingly well. However, if the hive population is too low. The cluster of bees will not be large enough to survive. Or, if the cluster loses contact with their honey stores. They will starve in place on the comb. Bees can die with a full box of honey on top but just out of reach. How many bees must you have in a cluster to survive cold temperatures? The answer varies. Genetics and colony health play a role in the cluster size needed to keep the colony alive. You also need a good population of healthy worker bees going into Winter. A clump of dead bees with heads stuck in the cells is a sign of starvation. I see more colonies that die from starvation in Winter than any other cause. Bees can starve to death with boxes of honey on the colony! How is this possible? The bee cluster must stay in constant contact with honey during periods of cold. If a prolonged cold wave prevents the bees from moving, they may consume all of the honey in reach. The bees become unable to generate heat and freeze. Even though they succumb to the cold, it is a lack of food that caused their deaths. So starvation is the culprit. And if they have brood in the comb, they will often NOT leave the brood to reach honey. Some regions have more problems with hive condensation than others. This is another instance when your climate plays a role in your honey bee management. A cluster of live bees, eating honey and generating heat, gives off moisture. The warm moisture rises to the top of the hive. If the temperature is very cold outside, moisture can condensate on the underside of the hive top. This causes water to drip down on the bees. Most of the time bees can cope with cold temperatures. But wet, cold bees are dead bees. Some beekeepers use quilt boxes and other strategies to absorb excess hive moisture. I have not needed to do that in my area. However, it may be something to consider for your hives depending on where you live. Not all beekeepers need to wrap up hives during Winter. If you live in an area that benefits from hive wrapping, be sure to allow for good ventilation. Even a Popsicle stick on the top box will raise the outer cover up just enough. When did you last notice hive activity? Your beekeeping journal is a good place to keep records. Check your hive monthly. No, you don’t always have to open the hive. Place your ear near the hive (on the back side please). Tap gently on the side of the hive (Or you can use a stethoscope), you should hear a healthy buzz. Failure to hear a buzz indicates a need to look inside. If your colony is dead, you will want to remove it from the bee yard promptly. You don’t want other bees to rob out any honey stores before you have had a chance to inspect. Robbing bees spread disease from hive to hive. Also, if the colony died in the last couple of days, varroa mites may get on robbers and ride back to a new home. 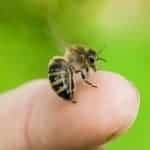 If no sign of disease is present, excess honey can be frozen and used later to feed needy colonies. Do you see a large number of dead mites on the bottom board? Varroa Mites spread viruses that contribute to killing bees. Colony collapse due to varroa is more common in late Fall. However, heavy mite infestations shorten bee lives and cause the population to drop. Short-lived bees may not live until Spring. This leaves the colony without enough bees in the cluster to generate heat. Dead bees that look deformed with short abdomens or missing wings are another sign of varroa. A varroa infested colony is more subject to viruses. This makes the colony unhealthy and less able to sustain life. Did you successfully treat for varroa?Sometimes bees will vacate the hive when conditions are too bad. 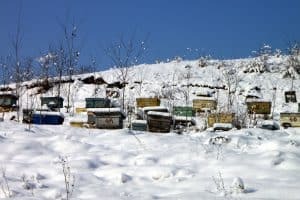 Disease Can Kill Bee Hives In Winter Too! Do you see any dead brood? That’s okay some dead brood is normal but you may want to investigate a bit father. Smell the brood – Is it stinky? I mean seriously stinky. If you are concerned about American Foul Brood, you can send a sample off to the bee lab for testing. American Foul Brood is a serious issue and occurs more in some regions of the country than others. I have never seen it in my hives but you should always be on the lookout for it. Brown stains all over the outside of the hive are often signs of Nosema. This dysentery condition weakens bee colonies and can cause bee death. A little bee poop staining is not cause for alarm. Bees can have dysentery without having Nosema. And, they can have Nosema without having dysentery. Some treatments are available for Nosema treatment but beekeepers argue over their effectiveness. Do you see a moisture problem? As you open the hive, was the underside of the top dry? Bees can withstand cold temperatures. They cannot survive being wet and cold. 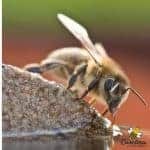 Avoid feeding bees sugar water during Winter. This can add to moisture in the hive. If you live in a cold climate, they will not be able to break cluster and access the sugar water anyway. It is very difficult for the bees to reduce the moisture content of the liquid during Winter. How many brood chambers do you use? Some people use 2 deeps, some mediums. I use a deep and a shallow for the bees. Everything above that will be for me. Do you use a Queen excluder? That’s okay. Did you take it off the hive for winter? No? Oh please say that yes you did take it off. If not, as Winter progresses and the colony moves up how will the queen go with them? She cant. If the queen is trapped below the excluder she will die. Without a queen, colony numbers will eventually drop to a non-sustainable level. Did you find a cluster of dead bees with their heads in cells? This is the common indicator of death by starvation. The cluster could not or would not move to stay in contact with honey stores. Sometimes they don’t move even when it seems they could have – we don’t know why. What about varroa mites? Did you do a mite check early enough in the year for the bees to raise healthy winter bees? Did you check to see if it worked? If you don’t check after treatment – you don’t know it worked. Varroa mites can easily be responsible for colony deaths. The sad truth is that losing bee colonies in Winter is a common thing for beekeepers. In recent years, the percentage of Winter colony losses has grown. Twenty years ago a beekeeper might lose 10% of their colonies in Winter. So, if you had 10 colonies you lose 1. Today, it is not uncommon to lose 50% or more. That’s half. It is very disappointing to lose bee colonies, but a beekeeper should not be too discouraged. Finding dead bees in your Winter hive does represent a loss. And sometimes, we lose more than 1 colony during Winter. 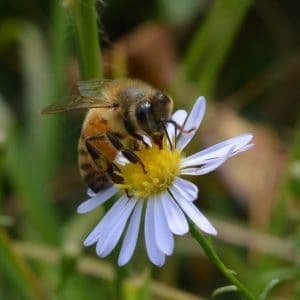 Bees store Fall pollen for use in Winter. It is a loss but it is also a learning experience that can help you grow as a beekeeper. But hey, if you want to hang your head and shed a few tears. That’s okay – I’ve done it.